The concept at Baylor University Medical Center Station unites the century-old hospital campus with the equally historical Deep Ellum neighborhood. The station is conceived as a vibrant public space and includes a two-acre plaza that can be many things to many people - a play area, a retreat for hospital visitors and employees or a respite for commuters. The title for artist Karen Blessen's public art, On the Pulse, reflects the joining of these two divergent communities. At Baylor, one might find a doctor or a pastor - someone who takes the pulse of the community each and every day. Deep Ellum represents a different kind of pulse, the celebration of life through art and music. The platform area continues this theme. 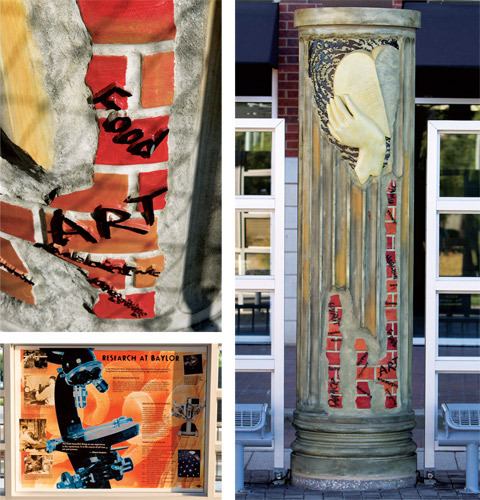 The columns contain a collage of elements reflecting the architecture and character of Deep Ellum and Baylor, including the image of a heart in hands and an EKG. The basic fluted column shape is a reference to the original Baylor Hospital columns, while the surface of the column erodes to reveal brick, much like you might find on the façade of a building in Deep Ellum. This peeling away of the layers shows the many lives the area has lived. The windscreens pay homage to people who have helped shape each community, providing a history of both the hospital and the area. The paving is quite unique, containing an imprint of a giant fingerprint, with five paths radiating from it. Each of these paths represent one of the five senses. By making the connection between the life experiences of Baylor and the life expressions of Deep Ellum, Blessen has created a station with a pulse all its own.